Welcome to the pickling, preserving, canning, dehydrating, puttin' up for the winter and oh my god will this give me botulism thread. Anything that involves the science and art of home food preservation belongs here with us in our slowly separating, darker on top and not completely covered in brine thread. Please note that the methods described in the following guide are suggestions that follow USDA guidelines. Methods and processing recommendations are different in different parts of the world. We'll discuss this more when it comes to processing methods, but please keep in mind we'll be following the U.S. standards which require all items to be pressure canned or water bath canned. When posting a recipe, please include processing method and time. The equipment is fairly simple to acquire. You can use any large pot to can in as long as it has a rack that fits in it to keep the jars from touching the bottom and will allow for a full boil with jars inside. Although you don't specifically need a huge granite ware canner, it's a great thing to have. A note about Stoves! Important! The most basic thing you will need is a heat source, your stove. However you cannot can on a flat top glass/ceramic stove! Why? These stoves have heat sensors that will not allow the stovetop to get to a certain temperature and endanger the stovetop shattering. This sensor will likely fluctuate or automatically turn on and off, never allowing your huge pot of water to come to a boil and thus, not safely canning your food. Check with your stove manufacturer to see if it can handle a flat bottom canner and maintain high temperatures for long periods of time. 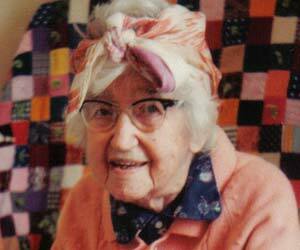 "Did you hear how Unis tried to can up her peaches in old mayonnaise jars? She ended with glass shard stew!" 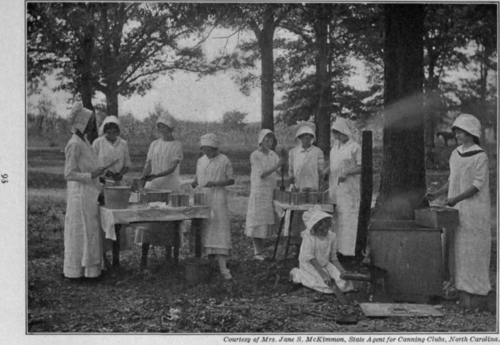 "Such a shame she didn't ask us for one or our many cases of Mason jars"
Laughter "Canning in mayonnaise jars. Oh lordy! Dumber than a bag of hammers!" 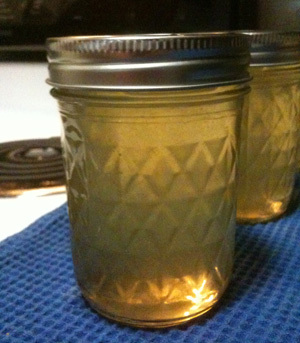 Make sure to use jars that are manufactured to use for home canning. 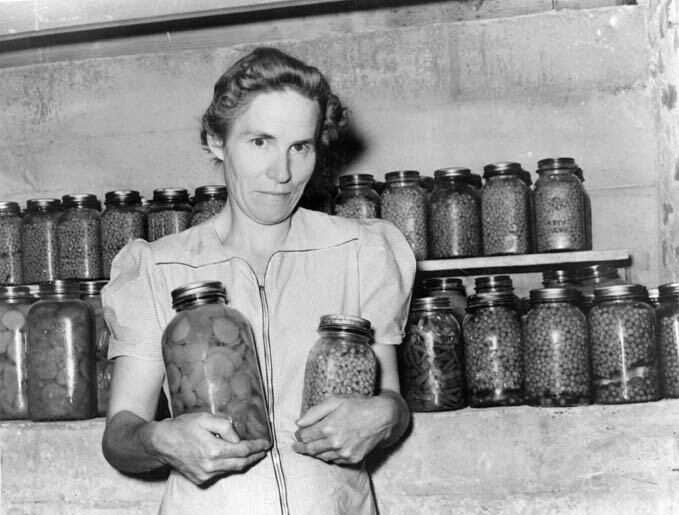 Although Grandma may have done it, don't save and re-use store bought jars. Since you don't know how or to what specifications they were manufactured, they may not be able to withstand the thermal shock or canning process. Re-using random jars is the primary reason for broken jars. Use the disposable rubber ring lids only once. Once the seal has been used, it's done. Most of the tools above can be purchased together in a canning starter kit. Jars only need to be tightened to finger tight so ditch the ring tightener that comes with this kit as it is pretty useless. Always inspect your equipment. Make sure your jars are free from chips, cracks, warping or irregularity. Inspect your lids to make sure the seals aren’t cracked, the lids are straight and flat and the metal is rust free. Use rings that are rust-free and not bent. Make sure everything you use is clean. You will sanitize everything in the process of canning but run everything through the dishwasher or hand wash and thoroughly dry first. I really can't stress enough how important it is to follow a recipe. Following a good, tested recipe assures the food had the proper pH balance which will lessen the chance of spoilage, botulism or other microbial attacks. Plus tested recipes are proven good tasting and compensate for difference in ingredients from year to year and batch to batch. How do you tell if a recipe is good? It should come from a dependable source that has been updated or comes from a source since 1990. It should also call for the most modern, up to date methods and ingredients. Always work in batches and resist the urge to double, triple, or halve recipes. Imprecise measurements can change the pH level of the food particularly when paring down amounts. Multiplying recipes is especially detrimental to jam and jelly. Larger quantities increase cooking time and evaporation time, resulting in products that turn rubbery and dark before getting to jelly state. Longer cooking times also increase the likelihood the jam won't set or will burn or foam up quickly and overflow while cooking. I reckin' I managed to chase the goats out so think we're good as far as bein' clean. 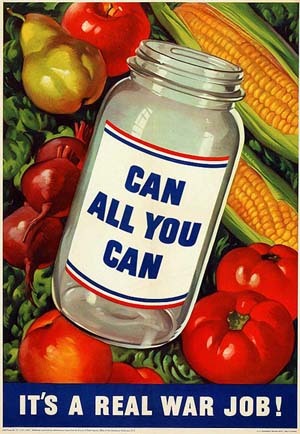 Sanitation is the key to canning success. Sanitary conditions ensure the products you make are safe, do not have contamination issues and taste the best. Thoroughly clean all food and inspect everything, discarding or removing soft, bad parts. Wash all your canning equipment beforehand and boil everything you will be using to can at least 10 minutes. This includes food funnel, thongs, and jars. Boiling the jars also helps prevent breaking due to thermal shock. The Exception to this is the seals. Since boiling and running them through a dishwasher cycle will ruin the can lid seals, keep your lids simmering in a separate pot. I also helps to not have to dig little lids and rings out of a huge boiling pot of water. "Looks like this batch is hosed." "Guess we should have processed this in a water bath canner." "Better burn it in the still." Although in this thread I will emphasize USDA recommendations, some preservation standards are less strict and processing times, recommended methods and approved equipment vary from country to county. Many recipes from the UK, Australia and Europe will not include processing times or methods, simply advising to pack and seal in hot jars which is commonly referred to as the "open kettle" method. Likewise, equipment like reusable seals and rubber ring seals are available although they do not meet USDA guidelines. I encourage everyone to follow processing times and use USDA approved equipment as it is the safest and most fool-proof method to ensure high food safety. If you decide to use alternative methods, you do so at your own risk and will have a higher incidence of spoilage and chance of botulism. Heating your items to a temperature hot enough to kill botulism spores greatly reduces your chances of contamination. In the USA, botulism cases are very rare, but most cases come from improperly handled or preserved home canned food. No matter what, never use paraffin wax seals or dirty/unsanitary equipment and jars. 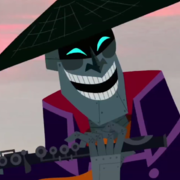 You will die. Now you don't want botulism, do you? Once your jelly/jam/pickles/whatever is ready, ladle or pack everything into your boiled sterilized jars and follow the head space recommendation in your recipe. Make sure to wipe the jar rims with a clean paper towel to get any gunk off that might interfere with the seal. Place the seal without touching it on each jar then tighten the ring to finger tightness. Process according to the recipe instructions. Depending on the density of your product, ambient room temperature, jar size and process time, your jars could be very hot for many hours after your processing is done. 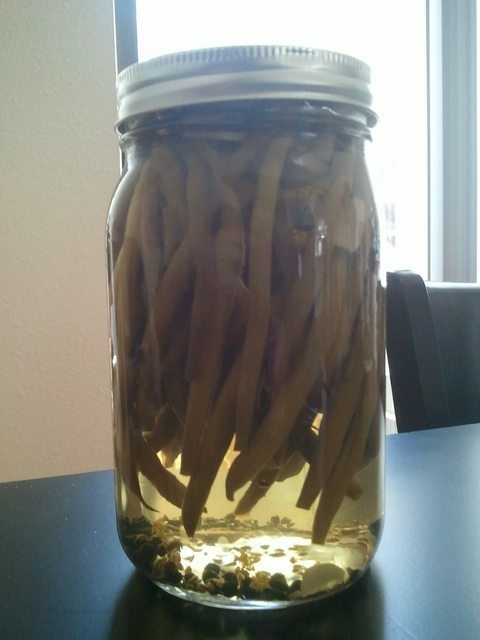 Use caution in handling your jars. Excessive handling while the jars are still hot can also cause the seals to fail. Let jellies and jams stand at least 24 hours although 2 days would be best. Some recipes may take 2 days to set. After 2 days you should know for sure if it’s going to set properly. 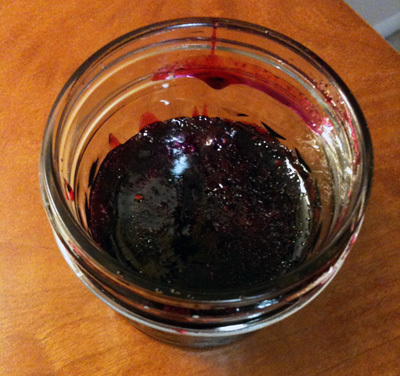 Make sure to let your jars cool in the upright position so that the jelly or jam forms a flat top. Let pickles rest for at least 6 weeks to allow the flavors to meld. The longer they are left to cure the better they will taste when opened. Check all your seals to make sure they created a proper vacuum. This can be done by removing the rings and picking the jar up by the seal. The seal tops should be depressed and not pop when they are good, but don’t rely on this. Check each one. As soon as you can, label and date your jars. You’ll be surprised how much everything looks alike months from now or when you are hungry. Make sure you clearly date everything with the month and year. This is good for stock rotation as well as being able to isolate a batch that may have not set well, had a contamination issue, etc. Store everything in a cool dry place out of the sun with the rings off. Over time the rings can rust to the seals. The USDA guidelines say that home canned items are good for up to 1 year although properly canned food can last much longer. After 1 year texture, flavor, color and nutrition quality may suffer. If the food changes color, leaks, fizzes, rises up in the jar, purges, has grown mold or smells off when opened, DISCARD! What is Pectin? Do I have to use it? My recipe from 1852 doesn’t include it! Pectin is a naturally occurring gelling agent found in food. The pectin that you buy at the store is usually extracted from apples or citrus fruit. Many older recipes do not include this ingredient but most modern jam and jelly recipes will. Pectin cuts down on cooking time and can help your jam or jelly set more reliably. What is the difference between water bath and pressure canning? Water bath canning is used for high acid food which had a pH of 4.5 or below. Examples of said foods are pickles, tomatoes, jams and jellies, sweet spreads like chutneys, etc. Pressure canners are used for low acid foods that require longer processing times and higher temperatures to be safe. Examples of these foods include cubed squash, soups that contain meat or dairy products, stock and water packed vegetables. I had to boil the poo poo out of these jars for like, 10 hours and they still got moldy. Guess I should have used a cookbook printed after Hitler was dead! Can I process stuff with meat/dairy/low acid food in the water bath canner? My cookbook from 1947 says I can if I boil it for 5 hours! No, water bath canning doesn’t get hot enough to make those foods safe. See the USDA about that and don’t kill anyone because you’re afraid to use the pressure canner. My jar didn’t seal? Can I just re-process it? Don’t re-process a jar with the same seal. If you jar didn’t seal properly, refrigerate as soon as it’s cool enough to handle and use within a few weeks. The recipe said cooking time would be 10 minutes but it took more like 20. What happened? The ambient humidity, size of cooking vessel, natural pectin level and water content of the fruit all effect cooking time. Cooking time should be seen as approximations. Always keep an eye on your jelly and test frequently. Why do you insist that everything should be processed? I just do this crazy assed method and I’ve never gotten sick! I’m so glad you’re not dead! 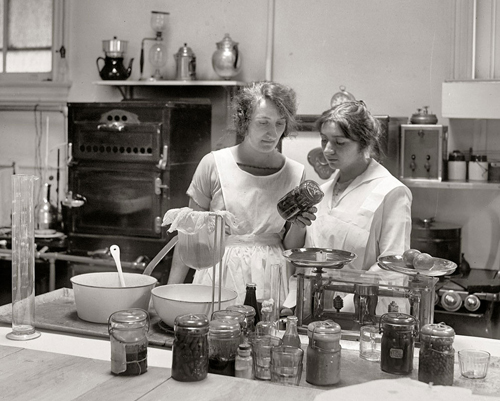 However, I’ll side with the USDA and advise that all recipes should be water bath or pressure canner processed. Sweet spreads should always be processed for a minimum of 5 minutes. Process your food! The recipe says quarts but I’m doing pints. Can I cut down on the processing time? No. No matter what size jar you put your product in, follow the recipe processing time. This recipe calls for 8 lbs of sugar and that seems like a lot. Can I just cut down on it? There are lots of low and no sugar recipes out there so I suggest you find one that had less sugar and follow it. Never change recipes on the fly since it could change the pH level or cause the jam to not set properly. Runny and unset jam is the bane of every canner’s existence, especially beginners. Jam and Jelly’s set point at 220 degrees F. Take the temperature to see if it has reached that point. There are also many jelly tests you can do. Throw a few flat saucers in the freezer and when you think your jelly is getting to the right point, drop a spoonful on it and let it sit for a minute. If it forms a skin or had a jammy texture then you’re ready. If it’s syrupy, keep going. My favorite test is the sheet test. Take a spoon that’s been sitting in ice water and stir it in your jam. Watch the drips. If the drips glob or roll together thickly then it’s done. If the drops are runny and act more like rain, your jam needs more time. What if I’m a lazy rear end and I don’t want to skim the foam? The foam a jelly or jam produces isn’t harmful and won’t hurt what you make. It will make it ugly though. My jelly is like syrup. What do I do? My pickle brine went cloudy. Can I still eat this stuff? Pickle brine can go cloudy for a few reasons. If your used table salt instead of pickling salt, the iodine could have reacted with the vinegar to make it cloudy. Hard water or cucumber particulate could be floating around, as can spices. It can also be yeast. Open a jar and take a smell. Yeast contamination will smell beery or bready. 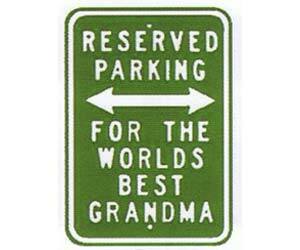 Otherwise, you’re good to go. My pickles are floating. What gives? Fruit and vegetables often shrink when pickled, especially when processed. When preparing your pickles wear rubber gloves and pack the food in as tightly as possible without crushing the fruit or vegetables. After filling the jars with brine, tap the jars lightly on padded surface (like a counter with a tea towel) or use a chop stick to move the pickles around and remove as many air bubbles as possible. Re-fill the brine to the proper head space after removing the air bubbles. Even with expert packing, you pickles are likely to float a little. Ok, so I bubbled the jars and stuff. However, the tops of my pickles are floating above the brine. Will they rot off and kill me? Despite best efforts, pickles will sometimes still float to the tops of the jars and some of the tips or bits might be above the brine. The parts of the pickles that aren't fully submerged may turn a darker color, shrivel or just not taste as good. However, if you have a good seal they will be safe to eat. To help the brine saturate the food evenly, store your jars upside down for a week then right side up for a week and switch out every other week until used. As long as you have a good seal, your jars should be ok in this position although storing them upright is always the best. My pickles are limp and soggy. How do I get that coveted crunch? Soft or squishy pickles can be the result of a variety of factors, including very strong brine, soft fruits/vegetables, heat application and more. First and foremost, you can make refrigerator pickles, skipping the canning process altogether. Fridge pickles will be crisp because they skip the heat processing. However, this takes up storage space and doesn't make the product shelf stable. One option is using alum to improve crispness. Alum is a very uncommon ingredient in modern grocery stores and is usually called for in older recipes. Using alum for crispness usually requires soaking for several days, thorough rinsing and additional soaking to be successful. Food grade alum is available online, and would be what you wanted to use if you absolutely had to make a recipe the "authentic" or "old fashioned" way. You can also use pickling lime, which is calcium hydroxide, as a pre-soak to make things crisper. Most instructions will have you soaking, rinsing and repeating until the water is clear, which takes hours and multiple cycles to achieve. This is also not as readily available in modern grocery stores although it is easily ordered online. The most available and in my opinion the best option is "pickle crisp," which you can find where canning supplies are sold or through the Ball website. Pickle crisp is calcium chloride and is a very common additive in the industrial canning process. It is easy to use (just add a small measure directly to the jar, no soaking required), has the same effects as the old soak/rinse/repeat ways and is actually less expensive per jar than the alternatives. And as always, make sure you use firm, ripe fruits and veg for your pickles, follow instructions and don't adjust the strength of the brine and don't over-process items. Boil corn according to preference. Remove kernels from cobs. Return corn cobs to pot and cover with 2 quarts of water. 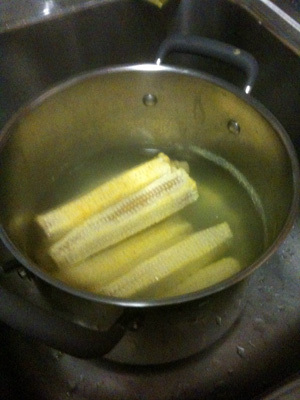 Boil corn cobs for 10 - 15 minutes. 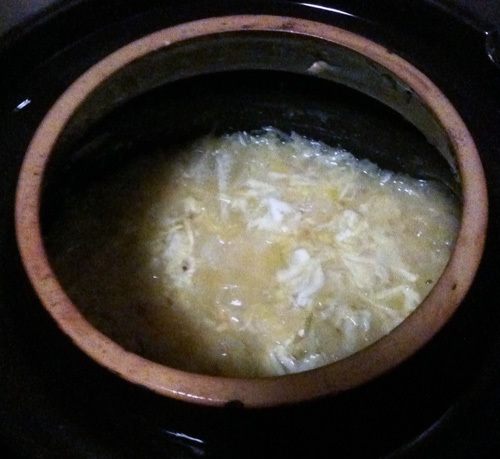 Remove from heat and strain the liquid from the pot, making sure all corn has been removed. Use the resulting liquid which should be 5 - 6 cups of pale yellow corn water. Add sugar to liquid and bring to full boil. Add the pectin and stir. Start doing the jelly test immediately as the jelly should form in less than 5 minutes. Ladle into hot sterilized 8 oz jars, seal and process for 10 minutes in a water bath canner. Let set and do not move for 24 hours. That's a weird jelly! I'm right in the process of making this jelly at the moment, with apples my parents gave me from their tree. I'm forgoing mint and instead tossed in some cinnamon, cloves, allspice, and cardamom in the initial boiling of the apples. I'll be (hopefully) jellifying everything tomorrow. I'm excited to send them a jar. You blame me and I'll blame you. Ready? We made pickled beets last weekend and dilly beans a few days ago. I'm really excited about apple picking season this year as well. 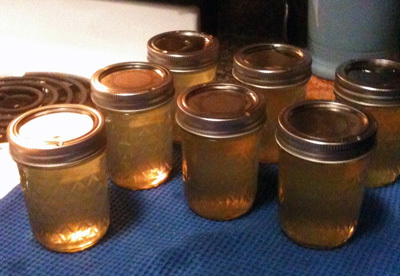 Last year we made applesauce, apple jelly, and a half-assed apple butter. I'm hoping to double down on apples this year and hopefully make a jelly that isn't overly sweet. The last one was a little too sugary for my taste. How about making syrups? I just picked a ton of blackberries and I think it's going to be way more jam that I'll ever need, even after giving away a bunch. These are Himalayan variety which grow like crazy all over the PNW and are on the seedy side. Can I just strain out the solids, and boil it with sugar? I don't want it to set at all, but I don't want it to be water like either, do you still use pectin? Looking on google, the recipes are all over the place. Great OP! Just a thought, homemade jams and jellies make great gifts. I did this last Christmas with my girlfriend at the time, and it was a huge hit. I just started canning this year myself. I have four gigantic tomato plants so thus far I've made tomato sauce, salsa and tomato paste. With the remaining 30-40lbs I'm probably just going to either make more sauce with them or just skin and seed them and can them like that. It's a lot more fun than I had anticipated. Commercial fruit syrups are artificially thickened with molecular gastronomy voodoo chemicals. You could probably use gum arabic, if you can find it/make it work, or something similar, but you're just not gonna get that Smucker's thick syrup without a lot of additional stuff added to it. What I would do is rinse and thoroughly pick through the blackberries then force them through a sieve or food mill to remove the seeds. You can also crush them up and drain them through a jelly back which takes longer but works absolutely fabulously. For a quick and simple syrup that you would need to be stored in the fridge, add equal measures sugar and fruit juice, bring to boiling, cool then bottle and cork. Pick over, rinse and drain berries. Place in a food processor and whirl them briefly to a coarse puree or push them through a food mill with a coarse disc. Stir in 1 cup of water. Bring mixture to a boil over medium heat. Reduce heat to low and simmer gently for 10 minutes, stirring occasionally. Strain the mixture through a cheesecloth or filter lined sieve, pressing moderately hard with a spoon when the juice flow slows. use care to not force pulp through the sieve. You can also use a jelly bag, which is what I would recommend. You should have roughly 4 cups of juice from this process. Add 1 cup of sugar for every cup of juice, keeping a 1/1 ratio. Add spices. Heat the berry, spice and sugar mixture over medium heat until the sugar is dissolved. Increase the heat to allow the mixture to boil and boil for 3 minutes. Remove mixture from the heat, stir in lemon juice and let cool until lukewarm. Strain the syrup through a very fine sieve or a sieve lined with 2 layers of dampened cheesecloth or 1 dampened nylon filter to take out any spice pieces. Discard spices. At this point if you're going to use it right away, just pour it into a bottle, cap or cork and use within a few months. To can for long term storage, heat the strained syrup to a boil and ladle it into clean, hot half pint or pint jars leaving 1/4 inch headspace. Process for 15 minutes in a water bath canner. As Kenning mentioned, commercial fruit syrups rely a lot on a ton of highly refined and sophisticated chemicals to get that particular mouth feel and consistency. It won't be quite the same as store bough, but I think that's a good thing because home made syrups rule. alright, cool. I think I will attempt to make some syrup then. Don't really think I'm going to add the spices though except maybe for the lemon. I just tried my first ever batch of jam, wild blackberry, and it wasn't too great. At first there's a big hit of sourish blackberry flavor and then a really cane sugar taste. Like sucking on a sugar packet. Not sure what went wrong, maybe too much sugar? I used the low sugar recipe though. Maybe that container of berries just wasn't very ripe. I picked a ton and I'm sure some were sour still, so it could happen. Nice choreography, babe. You haven't lost a step. Well then, let's dance! I made my first batch of sauerkraut today. I was amazed at how easy it is. 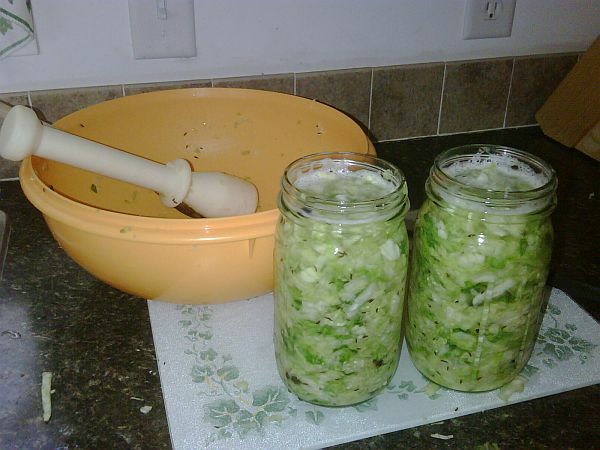 I shredded two heads of cabbage to make around five pounds. This bowl was full to the top. I sprinkled salt over each layer and mixed it in, giving it a final toss at the end. I used the plastic pusher from my Victorio strainer to pack the sauerkraut. I took the bowl outside first and pounded it on the back steps, then finished packing it into the jars. I then realized I didn't leave enough room at the top for the bags of water I wanted to use to keep the sauerkraut packed down. A wide mouth pint jar came in handy. I can't wait to taste this in 4 weeks. 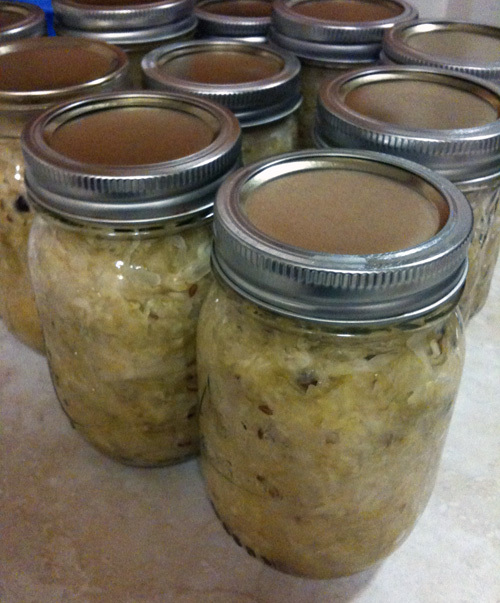 I just canned up my kraut today and it tastes amazing, head and shoulders above what you can get at the store. I flavored mine with juniper berries and caraway seeds. The recipe is incredibly simple. 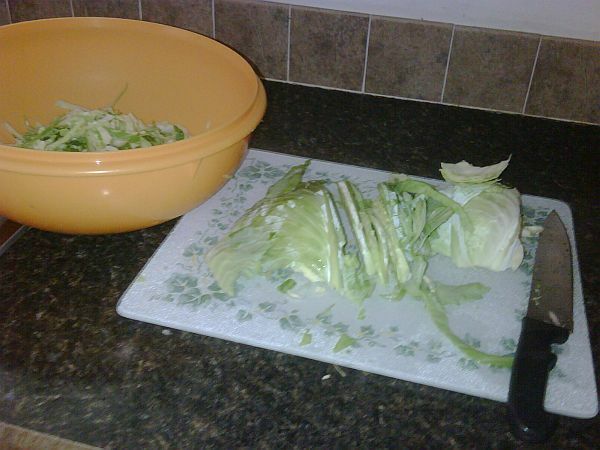 Shred cabbage finely, salt and mix thoroughly with hands, pound the poo poo out of it. Stuff this in a crock and cover with the crock stones or a weighted plate. I'm lucky enough to have a German fermenting crock that has special stone inserts and a water lip to seal the lid and keep the smell down. After 2 days if it doesn't have enough water to cover it, mix a brine with 3/4 measure salt to 10 measure water (3/4 cup of salt for 10 cups of water) and add to crock. Ferment in the crock 4 - 6 weeks depending on ambient temperature. Skim mold and other growths off the top every other day or so. The brine should be cloudy and the kraut should be golden when done. You can either fridge it or can it packed tightly with juice and process for 25 minutes in a water bath canner. This is the best thing and makes store bough kraut taste like simple vinegar cabbage (which by the way, most of it is). I was looking through my Ball canning book, and I'd love to make tomato sauce, but 45 pounds of tomatoes? If my tomato plant had even come close to producing that that would have been fine, but. I'm not sure how the hell to get/transport that many tomatoes otherwise. We're sure we can't half or quarter these recipes? A bushel of tomatoes is about 50 pounds, it's not that hard to transport, I've done it on the bus before. Especially in the case of tomatoes, no. Tomatoes are very borderline with pH level as is which is why most recipes worth their salt advise to add store bought lemon juice to assure the acidity level is reliable. As much as that is, 45 lbs only makes 7 quarts of sauce. If you have a smaller batch of tomatoes, and I certainly sympathize, I'd look for a "small batch" sauce recipe that use the amount of tomatoes you have. I would also consider just canning the tomatoes themselves or going with a product that doesn't require as many like salsa or chutney. For smaller batches freezing isn't a bad idea either. That way you can scale a recipe up or down as needed and not sweat the pH level. If changing the batch size of tomato sauce or what not matters for water baths, why can't you just use a pressure canner so that you can halve recipes? Sure, but I don't think processing a small amount in a pressure canner is very efficient. According to the National Center for Home Food Preservation, it takes about 5 lbs of tomatoes to make a single quart of sauce, so you'd be looking at maybe 1 quart and 1 pint to pressure can with the yield from a prosperous tomato plant. Plus, you'd need a pressure canner. Here are the instructions straight from the USDA (which still calls for a lemon juice added to each jar even when pressure canning): http://www.uga.edu/nchfp/how/can_03/tomato_sauce.html. My advice is still to use a recipe that uses the quantities you have on hand or using the method you intent to preserve with. Small batches can get to the point of diminishing returns, especially when going through the effort of canning. Sometimes it's best to make your sauce or jelly, throw it in the freezer and call it a day. I freeze my tomato sauce flat into ziploc bags and it works great, if anyone's worried about that. Should I go ahead and store these in the fridge? I'll probably crack one of the two jars open sooner than later to start eating them anyway, but I'm wondering if I should store the unopened one in the fridge as well since the tops of some of the beans might not be submerged in the brine. Floating food is the canner's bane and it happens with almost any pickles you do fresh pack method on. Even packing them as tightly as possible, there's always air bubbles, product shrinkage, absorption of the brine and other things. Next time you make this, wear some rubber gloves and pack the food into the jar as tightly as you can to the point where you can't shove even one more bean in there. That will help, but not eliminate the floating. I usually blanch all my pickles in the brine and let them sit for an hour before canning to lessen the floating and shrinking. It really helps but can make things not as crispy, so be warned. As for these, parts of the food that aren't covered in brine may turn a darker color or dry out, but as long as the seal is good they are safe to store at room temperature. What I do is flip them upside down and store them that way a week, then flip them right side up for the next week, etc. until I use them. If you are going to eat these right away I'd suggest cracking both jars open and combining them to keep in the fridge if you think everything will fit into one jar. 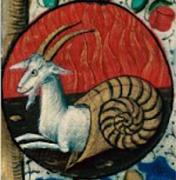 so storing them upside down for a bit won't gently caress with the seal at all? My pickles are all floating too. Oh man, I just tried a bit of my apple jelly. I actually had two batches worth of the juice, so I did a single batch and added some whole spices while I was simmering. It is intensely Christmas-y. Like, delicious, but probably a bit limited in application. For the next batch I'm going to forgo the additional spices during simmering and just see what happens. Might be a bit better, honestly. It tastes really good, mind, just more like something for pastries than for toast. 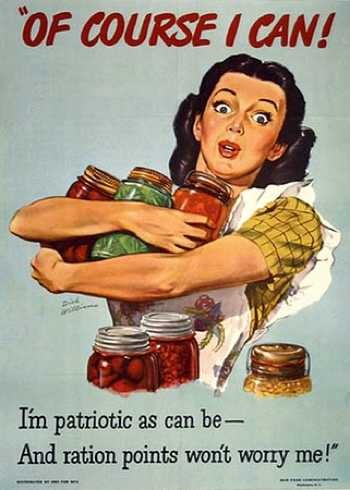 Anyone have any experience with canning meat, or more specifically rillettes? I want to make my rillettes shelf-stable so I can ship them for the holidays without having to overnight them. I'm not sure cooking them for an extra hour or two in a pressure canner isn't going to have an effect on the texture so before I waste time pressure-canning I want to check with you guys. Yum, rilettes. I have canned venison before, but it was cut in chunks and processed in a pressure canner. The issue with anything that would be a solid pack like pumpkin puree or something with a pate consistency is getting the food in the jar to the right temperature to be safe on the shelf. 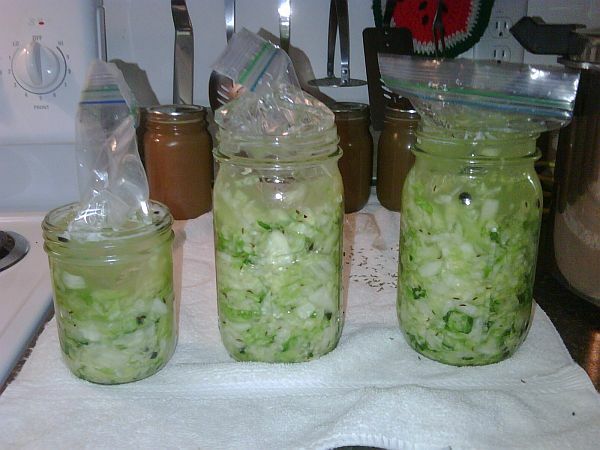 This is very difficult to do, and usually not recommended for home canning. Your stove will never get hot enough. Yes, storing them upside down will be fine as long as your seal is solid. I wouldn't keep them that way the whole time, but switching back and forth is fine. I am not experienced in canning meat products but this advice is spot on. Anything that has unknown density may not be heated through to the point where all the stuff got to a safe food preservation temperature. I'd also be concerned about the processing changing the quality or texture of the rillettes. I just made some elderberry jelly last night in what will probably be the last of the jelly making for me this season. It turned out with a kind of taffy-like consistency and I think I need to make sure the water content of the final juice is higher next time. It's still delicious and I'll be scarfing that down during cold and flu season. I didn't know elderberries were real. I though they were just some made up thing in Monty Python. Elderberries are fantastic. Elderberry cordials taste wonderful, both cold and warm. The early autumns of my childhood seem to be a never-ending parade of elderberry-stained hands and mouths. But being a newb, I broke a couple rules: I halved the recipe because buying 10 lbs of figs is expensive. Also, I didn't realize that bottled lemon juice was better in this instance and I used fresh squeezed. I DID add about a teaspoon extra to each can, though. What are the chances that I'm going to die of botulism? We had extra juice at the end and made some fig honey syrup which mostly just tastes like honey, but whatever. It will be delicious on pancakes. I like to make pickled onions, a traditional British thing (especially around Christmas time). Compared to all this pressure canning stuff, it's really easy. Leave them overnight in a colander filled with pickling salt. Chili peppers of some sort; habaneros will work fine. Vinegar - traditionally malt but cider works fine too. Bring all that poo poo to the boil, then let it cool completely. Take some Ball jars, cleaned with boiling water so they're not festering seats of infection. Put onions in jars with vinegar and spices, filling the jar to the top. Seal and leave in the back of the cupboard for two weeks or more. Enjoy either whole or sliced on good strong cheddar in a sandwich. Once the jar is opened I tend to keep it in the fridge, but I'm not sure that's actually necessary. You're preserving the onions in vinegar, so generally speaking your chances of icky germs are pretty low. The worst that'll happen is they'll go soft, like the store-bought pickled onions you can sometimes find in the 'ethnic' aisles of US supermarkets (because they import the cheapest variety they can find, leave it on a boat for weeks, then sell it at a premium to poor homesick expats). Proper pickled onions are supposed to be crunchy, and also to blow your head off. Honestly, you probably won't die or get botulism, but you will probably have less extra juice next time and may be happier with the full batch results. They'll probably also retain their goodness longer/be more shelf stable if you work in a smaller scale recipe or do a full batch next time. If you ever get curious, you can grab some pH test strips at the pharmacy or lab supply store and test your product. It's what I plan on doing as I take on the project of modernizing a whole ton of family recipes and creating new ones. Since tomatoes are just about done, although here in the Northwest we have a late season so they're still going strong, you could go for some tomato chutney or even do a spicy ketchup. I'll never go back to regular ketchup if you do. I'd skip mango chutney for a while since mangoes aren't in season again for a while. Chutneys are a fantastic choice! Blanch peaches for 1 minute is boiling water. Shock with cold water and remove skins. Cut open and remove pits. Transfer into food processor and blend until smooth. Combine mashed peaches, sugar and rosemary and bring to a boil. Let cook for about 10 minutes, until the fruit thickens and drips off spoon run together very thickly. When jam is at the thick and spreadable stage, add the lemon juice. Stir to combine. Remove pot from heat. Process in water bath 10 minutes. Can anyone recommend good recipes for Pickled Red Onion and Pickled white radish (daikon)? I had some pickled red onion somewhere and it was amazing. Also, I've gotten some banh mi's from a local Vietnamese place and their daikon/carrot/cucumber salad on top of it is quite tasty. 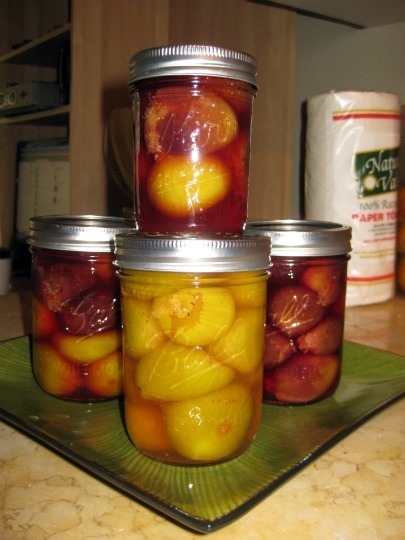 It may not be the same thing you're after, but look up a few posts for my pickled onions. I usually use white but red works too. The pickled daikon/cucumber/carrot salad on top is usually just a quick pickle so no canning needed. Basically shred your ingredients in equal parts and soak in water, vinegar, sugar and salt to taste. I usually shred 1 cucumber, a half a diakon, 2-3 carrots and soak them in 1 cup of water, 3 T of vinegar 1 T of sugar and 1 T of salt. I like mine sour though. I think the same thing can go for the pickled onions. Cucumber and onion quick pickle is a pretty classic side dish in many cuisines. Were the pickled onions slices, sweet, sour, etc? They were neon pink, and sweet and tangy. Didn't have a heavy onion flavor at all - could just eat them straight, but they were a garnish on some tacquito's if I remember right. The carrot/cucumber/radish salad is pretty drat easy. I'll have to give it a shot sometime this weekend, thanks! My brother was given a batch of 15 year old Seer Torshi (pickled garlic) from his boss; it's so god damned good it's unbelievable. It looks like a black poo poo nugget but the taste and the smell are great, plus apparently it's drat easy to make! My question is - what sort of stuff should I keep an eye out for that would indicate if it has gone bad? We put some cling wrap over it before putting the lid back on in case the vinegar caused the metal to rust or something, but so far everything looks (and tastes) good to my untrained eye. I have never heard of this before but it sounds drat interesting. Since it's already a very long aged product, you probably can't really tell just by looks when things have gone bad. Most canned products will change color, puff up, bubble, mold or smell bad when they go south (aside from Botulism contamination) so I'd definitely look for those things. You could also ask the gift giver how best to store it. Fun fact: Pickled garlic will often turn green or blue in the brine because of the copper sulfate and water soluble pigments it contains. It's still safe to eat but definitely put me off the first time I made it. Buy a gallon jar of Best Maid Pickles and add garlic cloves(probably 8, sliced or sliced down the middle) and a mix of peppers. Cherry peppers,jalapenos,haberneros. Cut those up, and I did not think they were all that hot, so I added about a 1/4th teaspoon of crushed red pepper flakes to the bottom of each jar. 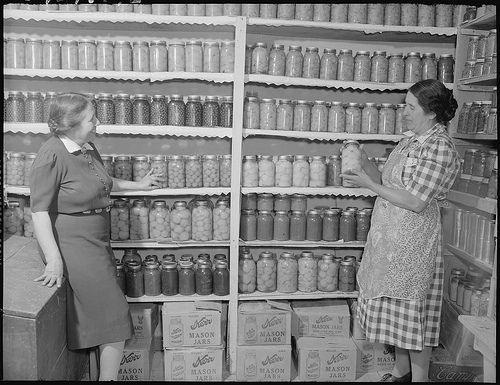 Cap the jars(we tightened them as tight as myself and Aunt Dennie could, so they would not leak) You need to take the pickles out and cut up, either in nickles or speers and take the juice out, BUT SAVE. Then just start layering in. Peppers, garlic, pickels, peppers, garlic, pickles, you get the picture and then add the juice back in till it covers ALL the pickles. So they were only capped 2 weeks. The longer they are capped, the hotter they should be. Not only is this a wall of text, it seems like there is probably a better way to do this. Dearest GWS, I want to make homemade spicy pickles. Can I just add some peppers and garlic into a normal recipe or would that upset the pH gods? Indeed, that's kind of a mess isn't it? I think what your friend is suggesting is that you need to buy Best Made whole pickles, cut them up either in spears or chips to reduce their size, add garlic, hot pepper flake and hot peppers of your choice and let them soak for 2 weeks in the fridge. I have no idea how exactly Best Made pickles taste (are they sweet, sour, vinegary, salty, etc) I'm betting you can just do this by making pickles yourself. Rather than buying them at the store and churching it up, I'd suggest you make regular dill pickles according to recipe and add hot peppers, hot pepper flake and more garlic to make it spicier. I do this all the time as as long as you don't gently caress with the pH of the brine itself or the processing time, you should be good upping the hot pepper amount. In fact, there are tons of recipes out there for spicy pickles specifically, and if you do them in the fridge like you friend suggests, experiment with ingredients since you won't have to deal with processing time.